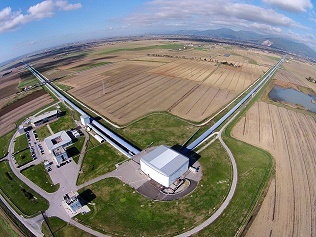 A third detection of gravitational waves, ripples in space and time, has been made. As was the case with the first two detections, the waves were generated when two black holes merged to form a larger black hole. The new-found black hole, located about 3 billion light-years away (twice as far away than the two previously discovered systems), has a mass of about 49 times that of our Sun, an intermediate value between those previously detected in 2015 (62 and 21 solar masses for the first and second detection, respectively). This discovery was published in the Physical Review Letters (1st June 2017). This third detection was announced during the GWPAW2017 conference organized by LAPP in Annecy. LAPP participated in this discovery through its involvement in the Virgo experiment, to which it has contributed significantly for many years, from the detector development and commissioning to data analysis.